Macon Beer Company’s Macon Dreams Bottle Release Party at 6 p.m. The Tubman Museum in partnership with the Otis Redding Foundation present a Visual Art Contest and Gallery Opening at 5 p.m.
Otis Redding Day brings live music and entertainment to Cherry Street Plaza starting at 11 a.m. 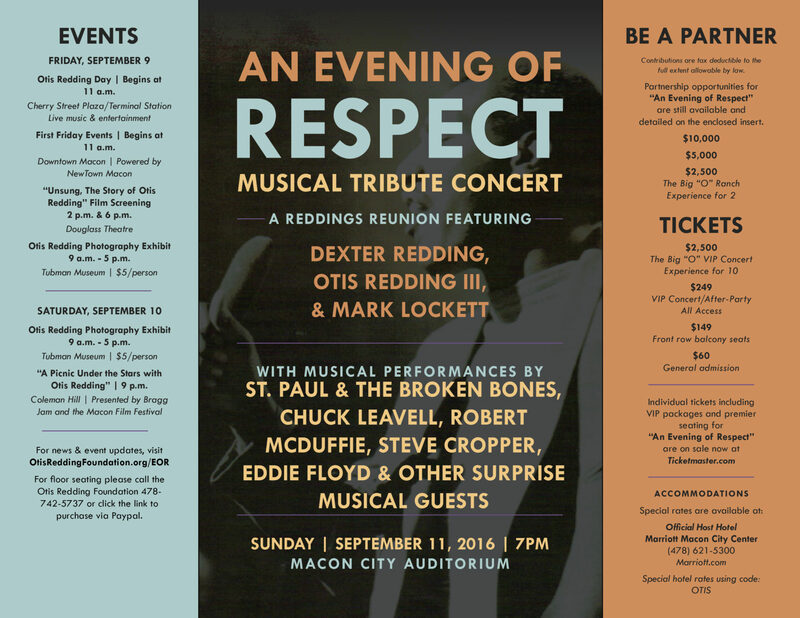 The Douglass Theatre presents a special screening of “Unsung” at 2 p.m. and 6 p.m.
“An Evening of Respect,” a star-studded tribute concert and fundraiser at the Macon City Auditorium featuring a reunion with the ’80s hit group The Reddings with Mark Lockett, St. Paul and the Broken Bones, Sam Moore, Robert McDuffie, Chuck Leavell, the Otis Redding Foundation DREAM Choir and others! Proceeds benefit the Otis Redding Foundation. 7 p.m. BUY TICKETS HERE. For floor seating please call the Otis Redding Foundation 478-742-5737.